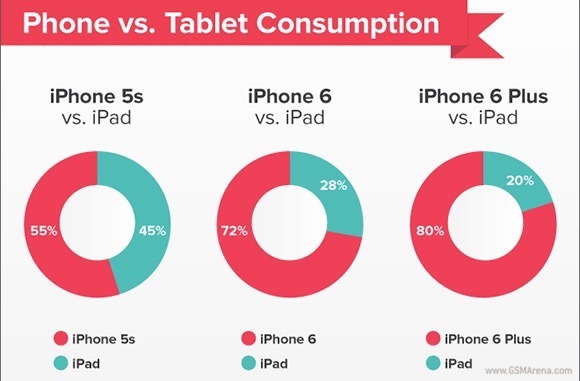 We received information that iphone 6 and 6 plus owners spend less time using their iPads than iPhone 5and older models. iPhone 6 owner spend 72% of their time viewing Pocket content on their handset versus 28% on their iPad. The difference gets even bigger in the case of the iPhone 6 Plus – 80% on the phablet versus 20% on the iPad. For comparison, iPhone 5s users spend 55% of their time on the Pocket app on their handset and 45% on their Apple slate. The last important information is that the 2.5x more users of the app prefer iPhone 6 over its plus version. If You are interested in unlocking your iPhone so that it can work in any network you wish. Please try our website sim-unlock.net, we can unlock the IMEI number of your phone so that it won’t have any sim blockade anymore.